Like many women, I was introduced to diet “tricks” and “hacks” at a young age. In my case, that was around twelve to thirteen years old. I consumed magazines and movies that constantly reminded me about the importance of dieting, losing weight, and looking skinny. Thinking there was only one type of “perfect body” made me feel I didn’t measure up. The feeling of not being good enough made me pay attention to the diet tricks I was promised on magazine covers. This is when my relationship with food changed. Food stopped being an experience to enjoy, and it became a way to create the body I thought I wanted. To be completely honest, my experience wasn’t as traumatic as what other women have suffered. I never vomited. I never stopped eating for days. Although I was happy whenever I came down with a stomach virus because my stomach looked completely flat afterward. I started experimenting with green juices—the wrong way. I would drink a spinach and cucumber juice (hating the taste) and immediately give myself permission to binge on pizza and other foods because I had “endured” the juicing. I began counting calories on a blackboard, like if I was doing math at school. For a period of time, I decided to eat only liquid and very soft foods, in tiny portions. After several months of my “experiments,” my father started commenting that the bones in my wrists became more noticeable, and my mom insisted I looked too thin, but there was not such thing at “too thin” in the mind of my teenage self. One time that I came down with another stomach virus, the doctor told me I was underweight, and she gave me a prescription for a supplement to gain weight. I was horrified at the idea of putting on weight. I refused, much to my mother’s concern. The irony was that even though I was restricting my food on a daily basis, I had no problem with binging on cake and ice cream while watching TV in my room. I thought if I ate very little most of the time, these foods were my prizes. Eating turned into a bittersweet experience. When I was in “diet mode,” I ate too little, with worry, and calculated the effect of everything I ate on my weight. When I was on “binge mode,” I ate without restrictions, with guilt in the back of my mind, feeling upset that I would have to go back to “diet” soon. Because of my inconsistent and emaciating eating habits, I had digestive problems most of my teenage years. My turning point happened when I developed serious digestive issues during holiday. For almost two weeks I couldn’t digest my food properly, I was bloated, and I had constant stomach pain. Because we were away on holiday in my grandparents’ house in the countryside in Costa Rica, there were no clinics or doctors around. My grandfather made me tea with ginger and digestive herbs from his garden to alleviate my pain. To my surprise, that same day my stomach problems diminished, and after two days I felt in perfect shape. I was baffled that drinking tea helped me get better when medications that I’d taken for years couldn’t fix my stomach problems. This is the moment when I realized food could heal my body. I began researching and learning about what food could do for me from the inside out. Quickly, I realized the damage I had been doing to my body by eating the way I was. I decided to start eating whole foods, mostly plant-based meals, almost right away. I wanted to heal my body and in the process I healed my relationship with food. In my mind, food became what it should have been all along: nourishment and pleasure. Fast forward to today, I’ve learned how to eat intuitively, how to eat with mindfulness and joy, and how to approach my body from a place of acceptance and love. Looking back, I realize how damaging my thoughts about food were. Seeing food as my enemy made me eat in a way that damaged my body—too little, too much, and never with absolute pleasure. This happens to so many people in our diet-crazed society. In this post, I want to help you identify and transform thoughts that are harming your relationship with food and holding you back from eating with joy. The way you eat is a reflection of your thoughts and perceptions. If you have been struggling with dieting, obsessing over calories, and restricting your meals, I want to help you take a step back and shift your mindset so you can heal your relationship with food. Letting go of these six toxic thoughts about food will help you eat mindfully, and with pleasure. 1. Thinking of food as a reward. Rewarding a healthy diet with unhealthy food, like during cheat days, defeats the purpose of eating with joy. Having cheat days can make your daily meals seem less enjoyable in comparison, which diminishes your pleasure. Also, cheat days often turn into binge eating episodes that leave you feeling physically and mentally upset. This doesn’t contribute to your health or happiness. A more mindful approach is to allow yourself to indulge on not-so-healthy foods occasionally in moderate portions, instead of reserving certain moments or days to pig out on junk food. Don’t see these indulgences as “rewards” or “prizes” reserved for certain occasions. At the same time, eat healthy food that makes you happy on a daily basis. Don’t limit your meals to bland or boring food. Expand your daily menu so you’re always eating healthy meals you like. 2. Using food as a punishment. Using food to punish yourself is just as damaging as using it to reward yourself. Eating less or not eating to “punish” yourself for overeating is only going to reinforce the feeling you have been “bad,” and this will make you more anxious and paranoid around food. For example, forcing yourself to eat only certain foods—green juices, “detox” teas, salads—that you dislike to compensate for binging episodes or because you feel “fat” will deprive your body of the nutrients you need and make you miserable. You don’t need to deprive your body; torturing yourself is not the answer. The best thing you can do to stop this cycle is to practice self-love. Love yourself, love your body, and know you don’t need to punish it. A healthy diet that keeps you fit is abundant in whole, nourishing foods. If you want to start over, don’t stop eating. Eat more healthy foods: berries, nuts, beans, lentils, quinoa, all the veggies you can imagine, plenty of water, whole grains, soups, and more. 3. Thinking of food as comfort. 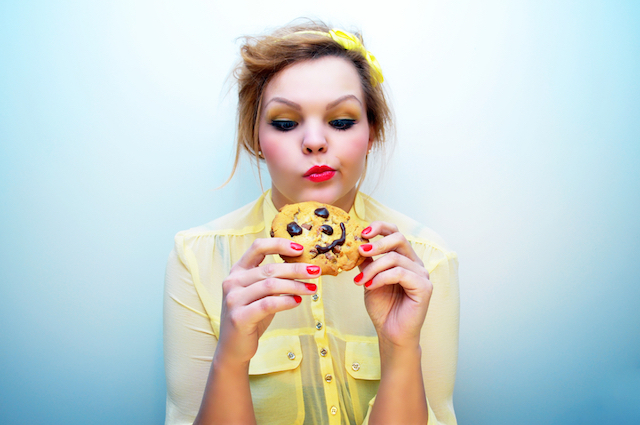 Emotional eating happens when we see food as a form of consolation. I ate cake many times a week because I thought it made me “happy.” I was a lonely teenager, and cake made me feel life was a little sweeter for a moment. Using food to cope when we feel sad, angry, lonely, or hurt can be addictive. We start to associate “happiness” with food, and the longer we do it, the harder it is to break the habit. Relying on food to feel better shuts down the opportunity to work on your problems in a meaningful way. The best thing you can do for yourself is to actively seek healthier ways to cope when things seem bad—and there are plenty of them. Exercising, meditating, listening to music, reading, taking a walk, playing with a kitten or a dog, brainstorming solutions to your problems, learning a new skill, taking a nap, and talking to friends are more effective and healthier ways to lift up your mood. Having a strict and inflexible diet will stress you and it may not even help you eat less, according to studies. Food restrictions often result in constant thoughts and cravings about the food you are “forbidding”—donuts, brownies, ice cream, or sugar- and this keeps you from fully enjoying the meals in your plate. Studies show that restricted eaters have more thoughts about food that non-restricted eaters. Obviously, this won’t let you feel at peace or happy with your food. I’m not saying you should eat without limits and binge on whatever you want, I’m suggestion to focus your efforts elsewhere: Instead of frantically forbidding foods, focus on adding healthier foods to your diet. Forbidding unhealthy food makes you stressed and is ineffective, but if you simply focus on eating more whole foods, your mind will be at peace and you will eat healthier without even noticing. 5. Seeing food as entertainment. When you go to the movies, do you eat popcorn because you’re truly hungry or just because that’s how it’s done? It’s probably the latter, right? In this context, popcorn is part of the entertaining experience. However, if you start turning to food to keep you entertained every time you’re bored, you will overeat and won’t savor your meals. Eating mindfully means being aware of your food and enjoying the experience. Using food as a distraction won’t let you enjoy your meals the same way. Instead of using food as entertainment, find constructive ways to occupy your mind. Activities that engage you, like playing a game, reading a novel, drawing, organizing or exercising are better for your mind and body. 6. Measuring your self-worth based on how much you eat. Finally, don’t give food the power to measure your self-worth. You’re more than what or how much you eat. Beating yourself up over what you eat is exactly what harms your relationship with food and steals your happiness. If you feel you haven’t been eating healthy, don’t get angry with yourself. You can always make a change for the better and improve your diet whenever you decide. It’s important you see food as your ally, not as the enemy. Food is not meant to make you feel guilty, worried, or restrict you in any way. It is there to nourish, support you, and make you feel your best. If you want to heal your relationship with food, begin by transforming the harmful thoughts that keep you from fully enjoying your eating experience. Brenda Godinez is the blogger and food nerd behind Crave the Benefits. Her mission is to help you make healthy eating happen, regardless of your schedule, budget, or lifestyle. You can get her free video class How To Eat Healthy On A Crazy Busy Schedule here.